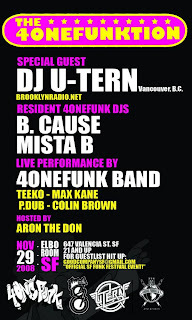 U-Tern's first apperance in San Francisco, November 29th at the Elbo Room (647 Valencia Street). Expect deep funk, boogie, disco music all night! THis is a party I would love to attend!! man, oh man, oh man! i only lived there for 12 years...you couldn't have come then before i moved to rio? seriously though, you are in great company (say what's up to max and josh for me) and the elbo room is a cool space! no doubt, it will be rocking! your set will definitely be appreciated and i've no doubt you will be wanting to return before your return flight even lands. I second the notion for a stop in Seattle on your way back! !